The morning session at Arctia off.ice and the afternoon session at Castrén & Snellman's Attorneys Ltd headquarters. Helsinki Airport is located in Vantaa, about 20 kilometres from the centre of Helsinki. Train operates frequently from the airport to Helsinki Railway station. You can buy the ticket from the ticket machine or onboard from the conductor in a ticketing compartment. The ticked is valid for 90 minutes and is accepted for the tram as well. Finnair City Bus and Airport Bus 615 operate to and from Helsinki City Center (railway station). You can also use the Journey Planner of HSL to find the timetables and routes for airport buses. Klaus K Hotel is only 650 m walk from the Railway Station. Trams 3, 6 and 6T bring you from Railway station right to our front door. Please note to purchase your ticket in advance. It is not possible to buy the ticket in the tram. Please ask for the discount coupon at the reception. Q-Park Erottaja is located below the hotel and you can reach our main door easily just by taking a lift. To access the elevators drive to lowest level down to the Iso Erottaja (Bulevardi) and turn right from the gate. You can't access the elevator from the upper level. Entrance and exit are situated on Yrjönkatu 8-10 which is next to Kolmikulmapuisto (Diana Park). Passenger exits from the garage lead to Bulevardi, Erottajankatu, Ludviginkatu and Korkeavuorenkatu -streets. 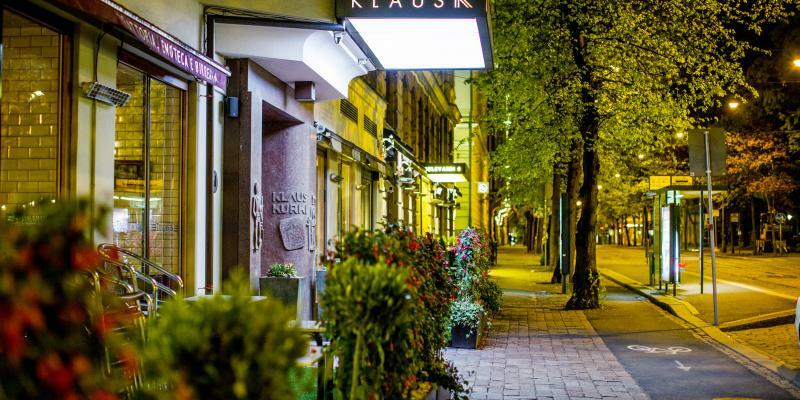 Klaus K Hotel is located in Helsinki’s vibrant city center. The hotel’s premises are already more than hundred years of age and are a combination of two architecturally important buildings; the one on the Erottaja side is architect’s Frans Sjöström’s signature work, built in 1882. The building on the Bulevard street was built in 1912 and designed by Lars Sonck, one of the most important architects of the national-romantic movement. Guest house activities already started to take place in the building in 1924 and the first actual hotel was opened in 1938. The hotel’s name is based folklore: The by Elias Lönnrot compiled Kanteletar, a collection of Finnish folk poetry published in 1840, includes the ballad “The Death of Elina”. It is a story of passion, betrayal, lies and envy, its main character being the ferocious Klaus Kurki. The name, Klaus Kurki, was carved into the granite of the entrance doorposts in 1938. Klaus K Hotel honors its tradition and background without getting trapped by its history. The hotel is fresh and different, stylish and experimental, modern and yet legendary. The heart and soul of the hotel was found in the Kalevala – Finland’s dramatic national epic which continues to fascinate travelers from around the world. Almost all of the furniture, carpets and objects have been tailored specifically for Klaus K Hotel. And the myths of the Kalevala can be found in surprising details.The corridor’s carpets between the guest rooms tell the main creation story from the Kalevala. They explain how the world and the universe were created from seven eggs. In many places throughout the hotel, guests will notice the egg shape. The white wood-made reception desk of Klaus K Hotel is shaped like an egg and depicts a bird’s nest as well with its fantastic, massive ceiling light fixture. In the staircase leading to/from The Klaus K Bar & Lounge, there is a large wall artwork depicting the Genesis according to Kaleva. 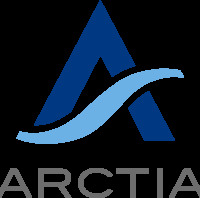 Arctia is a limited company owned by the state of Finland. Arctia provides icebreaking and specialised multipurpose vessel services in polar areas. As part of the 42nd Session, NSOCC Delegates will have a tour on board their newest LNG ship, IB Polaris. IB Polaris, the first LNG powered icebreaker in the world, joined Arctia’s fleet in September 2016. This unique vessel is able to use both liquefied natural gas (LNG) and low sulphur diesel oil as fuel. The use of LNG significantly reduces carbon emissions, making IB Polaris also the most environmentally friendly diesel electric icebreaker in the world. Built at Arctech Helsinki Shipyard, is an Ice class PC4 with a length of 110 meters and a beam of 24 meters. Her Operational draught is that of 8 meters (Displacement 1 0961 at design draught). Main engines Wärtsilä 2x 6000 kW, 2x 4500 kW, 1x 1280 kW, Dual fuel with 2 LNG tanks of 400 m³ each. Her speed is 17 knots and 6 knots speed at 1.2 meters ice. With a Pollard pull of 214 tonnes, accommodates a crew of 16 seafarers with solid Arctic experience. Castrén & Snellman is Finland’s oldest law firm. Was founded in the late spring of 1888, on June the 1st, by Kaarlo Castrén and Frans Emil Snellman. Messrs Castrén and Snellman announced that they would represent purely legal cases in all of the country’s upper and lower courts and undertake other assignments in the field at affordable prices. Finland was a primarily agrarian autonomous grand duchy of the Russian Empire. The economy was expanding rapidly. Industry was quickly becoming mechanised and business life was both growing and diversifying. These developments created a demand for legal services, particularly in Helsinki, which had become a centre of business life.